LONDON (Sporting Alert) — Stats from the Champions League last 16 knock-out round between Arsenal and Bayern Munich at Emirates Stadium on Wednesday night. The defending champions Bayern Munich outscored, out-passed, had more off the possessions and took more shots at goal than Arsenal in the game. The German Bundesliga side put together 863 passes on 95-percent completed on its way to scoring an impressive 2-0 victory on the road. On the possession column, Pep Guardiola’s men finished with a 79-21-percent advantage in a game that Arsenal were reduced to 10-man after goalkeeper Wojciech Szczesny was sent off for bringing down Arjen Robben inside the penalty box in the first half. 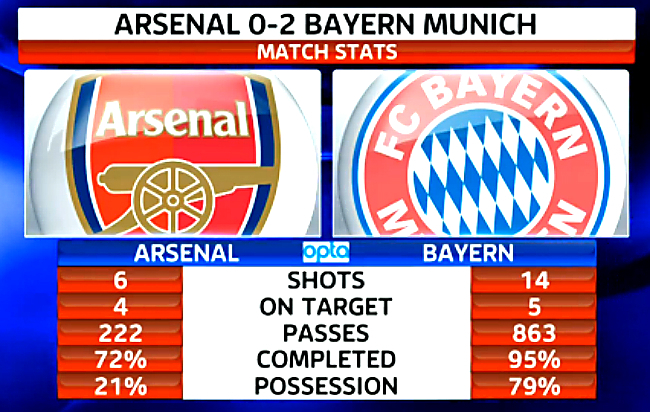 Bayern Munich had 14 shots compared to Arsenal’s 6. Both also missed penalty kicks in the first half of the clash at Emirates Stadium, with Mesut Ozil failing to score past Germany countryman and childhood friend Manuel Neuer, and David Alaba hitting his spot-kick off the post. But a bullet from Toni Kroos and a well placed header by Thomas Muller late in the game, sealed the win for Bayern Munich.